PayPal API credentials (username, password and signature) are necessary if you want to integrate your forms to PayPal Pro and PayPal Express. A Business or Premier account is needed in order to make calls to the PayPal servers. Login to PayPal using your account credentials. Copy the API Username, Password, and Signature generated. Note: You will have to remove existing credentials if you want to generate a new one. 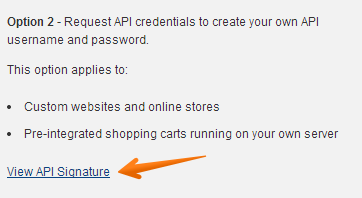 We highly recommend that you keep your API credentials safe for future reference. Perhaps you would care to update the page? How to limit products using Paypal?